The PicoSure laser removes tattoos FASTER than any other laser! PicoSure is the world’s first picosecond laser and the only advanced tattoo removal laser with PressureWave technology. 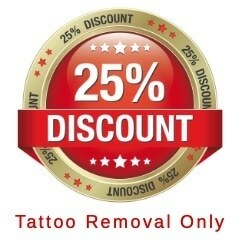 This is currently the most advanced laser treatment available for safe and effective tattoo removal. We urge you to do your research and make sure you insist on the absolute best laser available operated by highly experienced medical professionals. Traditional lasers (like the Q-Switched) use heat to break down tattoo ink. Instead of building up heat, the PICOSURE delivers energy so rapidly (in trillionths of a second) that the tiny particles that make up tattoo ink vibrate and shatter, without burning surrounding tissue. Less heat means less tissue damage and discomfort. This unprecedented advancement in laser technology safely and effectively erases tattoos with fewer treatments and better results. Even tattoos that have been treated previously but failed to clear can be removed. PicoSure works on all colours, including difficult ink colours, such as blues and greens, as well as previously treated tattoos. Achieving a more youthful appearance without the typical discomfort and downtime with the revolutionary PicoSure laser. This breakthrough technology can help to remove / reduce unwanted pigment, wrinkles and acne scars. PICOSURE Focus Array Lens Skin Rejuvenation with Downtime Measured in HOURS not Days! PicoSure is a quick and easy non-surgical, non-invasive laser skin treatment that focuses on problem areas like brown spots, sun damage, freckles, pigmented lesions, wrinkles or acne scars. It can be used to treat many areas including the chest or décolleté, face, hands, legs. Unlike lasers in the past that relied on intense heat energy which caused pain and led to significant skin redness and downtime (hours not days), this gentler treatment provides impressive results without the associated discomfort and downtime of traditional lasers. We use the LightSheer Desire, which is the new generation system for laser hair reduction. The Desire is recognised as the gold standard. The Desire delivers effective, fast and comfortable treatments. Diode lasers are very effective, especially for darker skin. It is comparatively less effective on finer, lighter hair. It has fast repetition rates and covers large areas and allows for fast treatment of larger body areas. Our ​ex-NHS surgical nurse is a laser expert will provide the very best treatment based on your skin physiology. Many of our clients come to us after experiencing poor results elsewhere. It simply isn't good enough to have a great laser machine. You also need an experienced professional who knows how to ​use the correct laser machine settings ​​for each client based on their physiology. Book a FREE consultation and skin patch test today.